Where to Buy Wartrol ? Like many wart sufferers, you know the problems associated with them and how difficult they may be to remove and to keep from growing back. While not all warts have to be removed, you may want to go that route if you suffer noticeable pain, embarrassment, the wart is easily irritated, has spread, or cannot be removed. In cases like this, you may decide it needs to be removed. We would like to take some time to walk you through problems with warts, and how you may benefit from a wart remover called Wartrol. 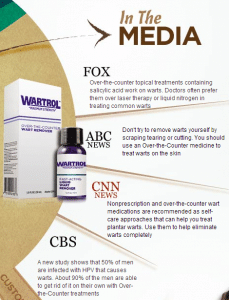 Wartrol is marketed as an over the counter (OTC) “maximum strength” wart remover that has gotten a lot of play in online advertisements, as well as plugs on MSN, MSNBC, CNN.com, and USATODAY. In all fairness, if I’m going to review an OTC product I have to mention something that most other reviews do not – and something that many consumers may not realize. If a drug is sold as an OTC product, it is not always the maximum strength available. It is simply a drug you can buy without a prescription. In some cases, it may have a prescription equivalent that is many times stronger than what you can buy without a note from your doctor or prescriber. Because it is OTC, it also is less expensive. That being said, if you have warts and do not want to see a doctor for whatever reason – embarrassed, cannot afford an office visit or the cost of a prescription – then Wartrol is worth a look. It was launched in 2002, the same year it joined the Natural Products Association. It is distributed through Market Health Inc., a health and beauty network launched in 1998. If your decision to buy health and beauty products is affected by your perception of the manufacturer’s website or product packaging, for instance, then you may have a mixed reaction. While the official website is obviously well designed and contains clear, informative text, it is extremely busy – more like an infomercial than a serious, consumer driven website. I have to admit that I am not impressed by this sort of image, whether it is on product packaging, or advertisements in newspapers and magazines. The website offers its share of testimonials from satisfied customers, extolling how quickly the product works, and how it has restored self confidence in each of them. I would personally take these with a grain of salt. This is an online natural healthcare supplement, and the website is more of an advertisement than anything else. Warts are a skin growth caused by some types of the virus known as human papillomavirus (HPV), of which there are more than 100 known types. This infection only manifests itself on your skin or mucous membranes. But before we go any further, let us clear up one thing right now that other reviews have not: Though warts are caused by any number of HPV infections, not all types of HPV are caused by a sexually transmitted disease. And because not all medications are 100 percent effective for everyone, you should know that Wartrol works very well – but is not the ultimate cure for warts. There is no ultimate cure. In fact, some strains of HPV will go away on their own within a few years. Using Wartrol on genital warts is not something the manufacturer recommends, but because this is an OTC and non-prescription strength product, our standard disclaimer applies that you should be aware of: Use this product on genital warts at your own risk. Back to warts. There are more than 10 kinds, but we will give you a rundown of the five most common so you better understand Wartrol’s effectiveness. Common warts. Also known as Verruca vulgaris this has a rough surface and can grow anywhere on the body, though it is most common on hands. Flat warts (Verruca plana) are small, smooth, and flattened, often blending in with your skin can occur in groups, mostly on the face, neck, hands, wrists and knees. Periungual wart. This cauliflower-like cluster of warts that can crop up around the nails. These are perhaps the most difficult to cure. Filiform or digitate wart. Common on the face, especially near the eyelids and lips, these warts have a thread or finger-like appearance. Plantar wart, or Verruca plantaris, usually is found on pressure points on the soles of the feet. It is a hard sometimes painful lump, often with multiple black specks in the center. Warts are easily spread if you come into contact with the human papillomavirus, but not necessarily through sexual contact with another person. Once infected, you can spread warts by touching one, then touching another part of your body. The human papillomavirus that causes warts can also be spread through sharing towels, razors, or other personal items. If you bump into someone with a wart – actually touching the wart – then you may be infected, but not always. Rough growths under or around your fingernails or toenails. Abnormally dark or light skin surrounding the lesion. Numerous small, smooth, flat lesions on the forehead, cheeks, arms, or legs, often pinhead in size. Rough, round, or oval lesions on soles of feet — flat to slightly raised – which are painful to the touch or when pressure is applied. Small, hard, flat or raised skin lesion or lump. Wartrol is a topical liquid applied to warts with a small applicator brush. It is fast acting and painless, and uses FDA approved ingredients. It is a viable, less expensive alternative to going to see a doctor, which presents a number of issues to consider – the cost of the visit, the expense of prescription medication or other treatment, time taken for the appointment. Best of all, Wartrol uses many of the same ingredients employed by a doctor or dermatologist in their office for wart removal, but at a fraction of the cost. Warts can be spread easily. Warts that are removed have been known to return. If you are not careful with the removal procedure, your skin may be scarred. Keloids could form after removal, which we can tell you is a pretty nasty end result. Basically, this is excess scar tissue that grows in place of the removed wart – another skin problem to worry about. From what we have seen, Wartrol uses a proprietary blend of ingredients and all natural oils to initiate a process called Keratolysis, which removes the warts from your skin once they are dead. This process involves thinning the toughened skin layers created by the HPV virus, allowing for wart removal. One thing to point out about Wartrol is that while we recommend it as an excellent OTC wart removal product, it demands time and dedication. One application will not do the job. In the worst case scenario, fully removing the wart may take days or weeks. But it does work fast initially. Here are the steps you should follow: Wash and dry the wart, use the applicator brush to apply Wartrol, then let it air dry for about a minute. In less than 20 minutes, you will see signs the wart is starting to dissolve, but like I said, have patience. During this time, do not cover the wart with anything – no cloth wraps or bandages of any sort. Just let it work. The manufacturer recommends that you follow this regimen three times a day until the wart id gone. If you are going to make a decision on how to best treat warts, you need to start by asking questions and finding answers, particularly about ingredients in products that are marketed as homeopathic or all natural. Unlike many homeopathic treatments that use a blend of ingredients, Wartrol has only one active ingredient: A 17 percent solution of Salicylic Acid. So what exactly is Salicylic Acid? Salicylic Acid is used to treat many skin disorders besides common warts and plantar warts, such as acne, dandruff, psoriasis, seborrheic dermatitis of the skin and scalp, calluses, and corns depending on the dosage form and strength. Once applied, it will soften the natural skin surfaces that form a wart until the wart can be rubbed off with something like a pumice stone or perhaps a soft-shell fingernail file. Acts as an irritant, big time. After settling into your skin Salicylic Acid will constantly irritate it and possibly trigger an immune system response. If you remember correctly from any science class, the human immune system – once in a heightened state of awareness – will react by attempting to fight off viruses in your body: In this case, the human papillomavirus that causes wart growth. Ethyl Alcohol. Typically, this is used as a solvent. Flexible Collodion. This may help Wartrol dry as a thin film over the wart, helping the medication break down the wart so it can easily be removed. Menthol. When used topically, in the case of Wartrol, it may act to inhibit an itching sensation as the wart dies. Polysorbate-80. This likely works as an emulsifier, helping Wartrol stabilize as it works. Ascorbic Acid. As a nutritional supplement it is thought to help wounds heal faster. Hydroxypropylcellulose. This helps keep the skin around the wart hydrated. Do other legitimate remedies exist? Of course, like applying podophyllum resin paint, or encouraging interferon production to fight infection and the wart by applying certain topical creams. Another “home” treatment is the use of duct tape to cover the wart and kill it. Non-prescription cryotherapy is another option, where you spray two different chemicals onto the wart that are supposed to freeze and kill it. Research all herbal supplements before hand, and check with your doctor if you have any questions. Understand that this product, like any other, may have certain reactions with other OTC or prescription medication. Because Wartrol is an over the counter product, we would recommend simply checking with the pharmacist before purchasing it, but be prepared to give a list of any drugs you may already be taking. The product should not be used on a long term basis. If warts persist for months after daily applications, then you need to consult with your doctor about other treatment options. Wash the affected area, soaking it for up to five minutes in warm water if possible. Apply a small amount at a time with a brush sufficiently over each wart. Tip: Try a clean make-up brush. The Wartrol manufacturer clearly states this product is for external use only, and further warns that is should not be used on irritated skin, infected or reddened areas, if you are diabetic, or have poor blood circulation. Specifically, Wartrol is not meant to be used on skin conditions like birthmarks, moles, warts with hair growing out of them, and warts on the face or mucous membranes. Other common sense warnings apply. Do not get Wartrol in your eyes; if it gets in your eyes, flush them out with water for 15 minutes. And more caution: Do not inhale the vapours. Wartrol offers many benefits that we would like to mention. First of all, it uses only FDA approved, natural ingredients. This is important for any product marketed as homeopathic. Wartrol is a fast-acting liquid that does not require any bandages, wraps, or other follow-up care. It is marketed as an over the counter product, which means it can be bought without a prescription from a doctor. The big draw here is that means you can use the product at your own convenience and at a schedule you are comfortable with. There are no reported side effects to worry about. Wartrol can only be bought through its website, which I am not thrilled about. If the product truly works as well as they say, then why not make it easily available to as many people as possible – and not force them to wait for it to be shipped? Of course, the flip side is that you know you are getting a safe, effective, wart remover directly from the source. If you purchase online, you get more ordering options. A one month supply is $49.95 plus shipping, two months is $89.95, a four month supply costs $149.95 with 1 free bottle, and a six month supply goes for $199.95 but includes two bottles for free. One complaint with the ordering process: The Wartrol website does not display prices or shipping information until you start the ordering process, so if you want to go there just to “window shop,” you can forget it. This bothers me a bit. Wartrol can only be ordered online, and you have to wait for it to be delivered, sometimes up to 10 business days. It is a shame we cannot go to the corner drug store and buy it when we need it. What do we do in the mean time, continue to suffer through the pain and embarrassment of warts, waiting for the mail carrier? The Wartrol website mentions clinical studies, but does not offer factual information or answer pertinent questions: Where did the trials take place? Were the volunteers paid? Were medical professionals involved? This seems just a bit shady but, honestly, is the sort of marketing strategy that companies like this use. To be fair, I would like to point out that online research does exist that states of 52 wart removal remedies that were tested, topical creams that used Salicylic Acid did the best job overall. This study, cited by Harvey S. Gibbs, also goes on to say that the average cure rate was 75 percent. The price seems pretty steep. $49.95 for a small bottle only good for a month? Of course, if you only have a few warts that may not be a problem. If you are a chronic sufferer, however, you will need more than a one month supply or will have to look to a doctor for another solution. Try it, but do not become addicted to it as a quick fix. Orders cannot be cancelled. Once you place an order, your credit card is billed immediately and the shipping process starts the same day. Wartrol can be returned within 90 days for a refund, but only for unopened and unused products. You also need a return authorization number. If you are a wart sufferer, tired of the pain and potential embarrassment, you understand there is no single solution, but there is some simple advice to follow to avoid getting more warts: Avoid direct skin to skin contact with a wart on another person, especially their hands, and remember that if you touch your wart, or file it down, make sure you thoroughly wash your hands and the file afterward. Because this is generally considered a homeopathic product, you should be aware that other treatment options exist worth mentioning. Though humorous, there are some traditional folk remedies to be aware of, like using “stump water,” which collects in the stumps of dead trees and can be applied to the wart. Or rubbing the wart with a potato, then burying the potato and waiting for it to dry up – coincidentally, some insist the wart will dry up at the same time. 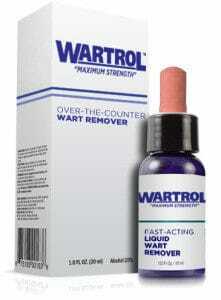 We can recommend Wartrol as a wart remover, at least a one month supply for an evaluation period. Our advice is to not get taken in by offers of free bottles with more expensive orders. Try it and see how it works, then make your own evaluation.